NOTE: If you click a numeric reference on the timeline below it brings up a fresh window. To continue browsing just click on the main timeline to hide the reference window. If you need a more concise overview you can browse the Concise Timeline instead. The Timeline dates below are also clickable, enabling you to switch between the brief and comprehensive version for any date. In the first quarter of 1967 there were over 270 border "incidents" causing rising concern in Israel. Landmine injures tractorist in Kibbutz Shamir. Explosion on train tracks near Kibbutz Lahav. Two Palestinians killed trying to demolish a water pump near Arad. 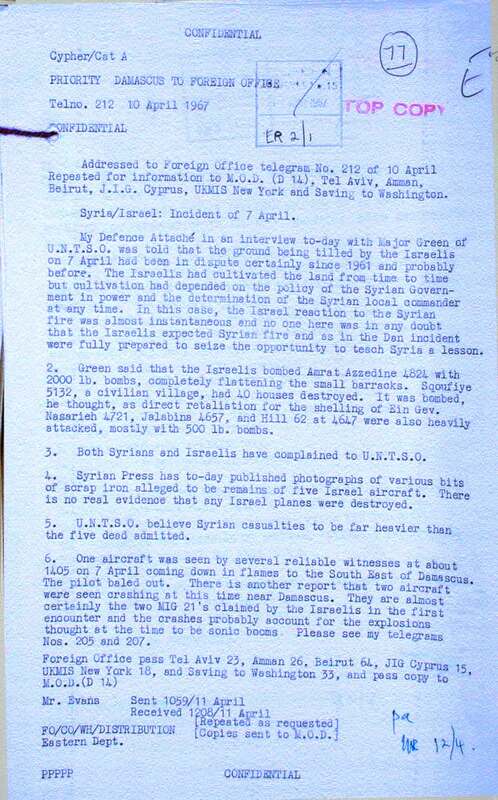 Confidential telegram to UK Foreign Office, sent 10th April, relating to 7th April exchange of fire. "...the ground being tilled by the Israelis on 7 April had been in dispute certainly since 1961 and probably before. The Israelis had cultivated the land from time to time but cultivation had depended on the policy of the Syrian local commander at any time. In this case the Israel reaction to the Syrian fire was almost instantaneous and noone was in any doubt that the Israelis expected Syrian fire and as in the Dan incident were fully prepared to sieze the opportunity to teach Syria a lesson..."
Anwar Sadat arrives back from Moscow with the information he gives to Nasser that Israel is massing 10-12 brigades in preparation for an attack on Syria, supposedly to take place May 17. He was told to expect "an Israeli invasion of Syria immediately after Independence Day, with the aim of overthrowing the Damascus regime"  The information is false, as were several similar previous Soviet warnings. - more detailed text here. Egypt moves it forces eastward across the Sinai desert towards the Israeli border. “The presence of the Emergency Forces in the Sinai desert had kept tensions down. We don’t have to look further for a United Nations success. Yet the Government of the United Arab Republic has made a formal request for the withdrawal of UNEF from its territory as soon as possible. 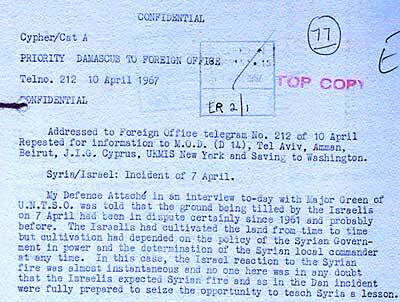 TELEGRAM FROM PM ESHKOL TO PRES JOHNSON:(extract) "First: The primary link in the chain of tension is the Syrian policy of terrorist infiltration and sabotage. From Under Secretary Rostow's conversation with Ambassador Harman, I am glad to learn that your government and mine are agreed on this. You are correct, Mr. President, in stating that we are having our patience tried to the limits. There have been 15 attempts at murder and sabotage in the past six weeks. We have not reacted. This in itself proves that there is no lack of temperance and responsibility on our part. On the other hand, the problem is not solved indefinitely by inaction. We cannot always rely on the stroke of fortune which has so far prevented the terrorist acts from taking the toll of life and injury intended by the perpetrators. Although many acts have been committed from Lebanon and Jordan, our present conviction is that Syria is responsible and is attempting to embroil other Arab states. We are alive to this stratagem and shall not cooperate with it. 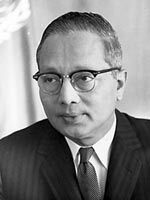 U Thant's decision was still provoking great unease within the UN, as reported by The Times: "Quite a few countries feel that the force should not have been withdrawn and virtually disbanded so suddenly at the behest of the United Arab Republic without allowing the United Nations General Assembly, which authorized its coming into existence, to discuss the matter...efforts (are) being made to see if some alternative basis for securing the Israel-Egyptian border…Most European and American countries and also a fair number of Asian and African countries, would welcome some such “salvage” operation. It would be resisted and rejected by the communist block, which has in the past consistently espoused the Arab case against Israel…Brazil and Canada (members of the Security Council) have contributed contingents to the Emergency Force (and) are believed to have argued against its withdrawal. 4pm: General Rikhye drove to the UN observation post on the Gaza-Tel Aviv road to deliver this message: “In accordance with instructions I have received from the Secretary-General of the United Nations, you will withdraw your guards and observation posts at 5 o’clock.”. . . .
By this time there were an estimated 40 thousand Egyptian troops and 500 tanks in the Sinai. Israel ordered an immediate large-scale mobilization of reserves. “Our forces are now entirely ready not only to repulse any aggression, but to initiate the act ourselves, and to explode the Zionist presence in the Arab homeland of Palestine. The Syrian army, with its finger on the trigger, is united. I believe that the time has come to begin a battle of anihilation.” - Syria’s Defence Minister Hafez Assad (later to be Syria’s President). The Times reported: Egypt and Israel faced each other directly tonight as the United Nations Emergency Force, which had stood between them for more than ten years, began its official withdrawal. The NY Times reported Egyptian soldiers massing in the Sinai. The NY Times reported that the PLO would be stepping up its attacks in Israel, that Cairo was calling up 10,000 reserves and that Iraq would be sending aid for a battle against Israel. GAS MASKS FOR ISRAEL: Israel asked on 19 May to buy for cash on an urgent basis 20,000 US Army M-17 gas masks to be air shipped to Israel for immediate distribution. The US Army can make 20,000 masks available immediately from its stocks. These are being prepared for shipment and could be dispatched as quickly as the GOI can arrange air charter. The Egyptians have used chemical agents, including nerve gas, in the Yemen recently. Israeli intelligence reports that Egypt has brought gas shells or bombs forward to the Sinai in its recent deployments. Although we believe it highly unlikely that Egypt would use gas against Israel, this possibility cannot be altogether discounted. Secretary Rusk is aware of and supports the Israeli request to purchase American masks, even though all concerned (including the Israelis) recognize that the number of masks involved is too small to do much good and that by themselves could not assure adequate protection against the type of gas which may be used. This would be essentially a psychological gesture. By his reported decision to close the Straits of Tiran, President Nasser has struck at Israel in one of her most sensitive areas. Eilat is her gateway to the east and the vital supplies of oil. ...In the present atmosphere of tension, time is not on Israel's side. She has had to react to the situation by calling up a large number of reserves, but the economy, already ailing slightly, cannot afford for long to be bled of the highly qualified manpower which has been taken back into the army. 2. Any decision on action is postponed for 48 hours, during which time the Foreign minister will explore the position of the United States. 3. The Prime Minister and the Foreign minister are empowered to decide, should they see fit, on a journey by the Foreign minister to Washington to meet President Johnson. Housewives, who had displayed restraint up until then, stormed the grocery stores, stocking up on canned goods, flour, oil and sugar in preparatrion for a long war. Thousands of Israelis paid their taxes and others donated cash and jewellery to the Defence Ministry to provide extra funds to purchase weapons. Neighbourhood groups formed on their own to build bomb shelters, dig trenches and volunteer for essential services. The nation's mobilisation was by now far advanced and the newspapers were filled with columns of cancelled meetings and postponed weddings "because of the situation". Old men and women now drove the public buses since the young drivers had been called up. Thousands of Israeli mothers baked cakes and tarts and sent them off to the Negev so their fighters would have something fresh to eat apart from combat rations. Civilians appeared in the outposts handing out cigarettes, soft drinks and magazines. Israelis were digging in, getting ready for war. Mobilisation started with phone calls to the commanders of the most important units. One of them, a lawyer in civilian life, reported for duty with his private secretary and driver and 'within ninety minutes was busy getting his brigade out of the card index and into the field'. The message passed down the line to officers who called NCOs, who called soldiers. Other units were called up by code words that were broadcast on the radio. The head of the Mercaz Harav Kook Yeshiva (an academy for the advanced study of Jewish texts) issued a ruling for his students being called up by the Military Police that "despite the Sabbath, they should board the trucks and go. They should board tanks and violate the prohibition against touching their tefillin (phylacteries) on Sabbath and take them with them when they go to join their units. ...in a national emergency, Army service falls into the category of "pikuach nefesh" (the saving of a life)." NY Times reports continuing Egyptian build up of military forces in the Sinai and new Syrian attacks on Israel. 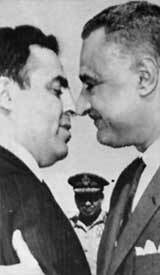 Jordan signed a five year mutual defense treaty with Egypt, thereby joining the military alliance already in place between Egypt and Syria.Jordanian forces were given to the command of an Egyptian General. (NB, the newspaper referred to the “armistice line”, not the “border” which is now claimed by the Palestinians to be a legal boundary). “Time is not on the side of peace”, said Mr Wilson solemnly several times tonight. 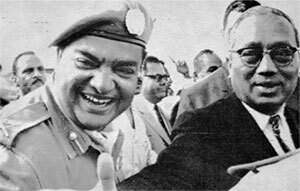 Everybody agreed it was a great pity that the Secretary-General had removed the United Nations force so hurriedly from the danger area. Sir Alec Douglas-Home: "...the first casualty (of this crisis) had been the United Nations. It would need an immense effort, an almost superhuman effort, to restore the prestige of that organization"
Sir Barnett Janner:" ...they could not expect the people of Israel, who have done nothing wrong, to sit for a prolonged period until the pincer movement had got them so entrapped that they could not go on." 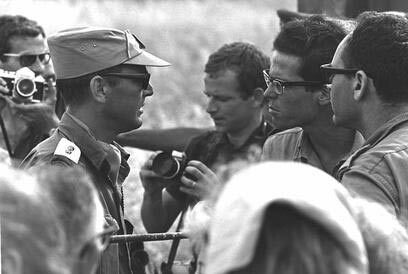 To create the illusion that war was not near Gen Moshe Dayan had thousands of soldiers released for the weekend. A CHURCHILL GIVES HIS BLOOD: Winston S. Churchill, the son of Mr. Randolph Churchill and grandson of Sir Winston Churchill, who is covering events in Israel for the “News of the World,” joined a queue of civilians waiting at Dizengoff Circle on Sunday to donate blood for the emergency blood banks which have been established in the city. Seventy tourists from Britain also donated blood before leaving for home. Syria had 63,000 troops and Jordan 55,000 – totalling 328,000 troops ready to fight Israel. The Arabs had twice the number of tanks compared to Israel (2,330 against 1000) and far more combat aircraft too (682 compared to Israel’s 286); They had 1,845 armoured personnel carriers compared to Israel’s 1,500. After hearing a report on the military and political situation from the Prime Minister, the Foreign minister, the Defence Minister, the Chief of Staff and the head of military intelligence the Government ascertained that the armies of Egypt, Syria and Jordan are deployed for immediate multifront aggression, threatening the very existence of the State. The Government resolves to take military action in order to liberate Israel from the stranglehold of aggression which is progressively being tightened around Israel. The Government authorises the Prime Minister and the Defence Minister to confirm to the General Staff of the IDF the time for action. Members of the Cabinet will receive as soon as possible the information concerning the military operation to be carried out. King Husain of Jordan today warned Britain and the United States that they stood to lose their friends in the Arab world for ever if they fell into the Zionist trap of supporting Israel in the present crisis. "There are no words I can use to express my disappointment at the attitude that the British Government has taken with regard to the Gulf of Aqaba", he told a crowded press conference at his palace in Amman. - The Times, June 5th 1967 p4, Nicholas Herbert, Amman "WARNING TO BRITAIN BY KING HUSAIN:Danger of losing Arab friends"
Abba Eban, Israel's Foreign Minister addresses UN Security Council: "I have just come from Jerusalem to tell the Security Council that Israel, by its independent effort and sacrifice, has passed from serious danger to successful resistance. Two days ago Israel's condition caused much concern across the humane and friendly world. Israel had reached a sombre hour. Let me try to evoke the point at which our fortunes stood. "Wars are not always begun by shots. They are often begun by action and the action which really created the state of war in an acute sense was the imposition of the blockade. To try to murder somebody by strangulation is just as much attempted murder as if you tried to murder him by a shot, and therefore the act of strangulation was the first violent, physical act which had its part in the sequence. But also on that Monday morning we acted against the movement of forces. The Egyptian air force had been making incursions into Israel before, whether for reconnaissance or for other reasons, but there had been a pattern of encroachment. One never knows when aircraft come towards you what their intention is." Eight Arab heads of state attended an Arab summit conference in Khartoum during August 29 ­ September 1, 1967, formulating what became known as the Khartoum Resolutions. 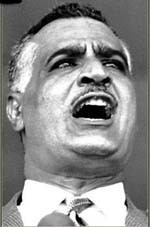 They called for the continued struggle against Israel, the creation of a fund to assist the economics of Egypt and Jordan, the lifting of an Arab oil boycott against the West and a new agreement to end the war in Yemen. By adopting the dictum of no peace with Israel, no recognition of Israel and no negotiations with Israel, the Arab states appeared to have slammed the door on any progress towards peace. The Resolutions became known as the "three noes".